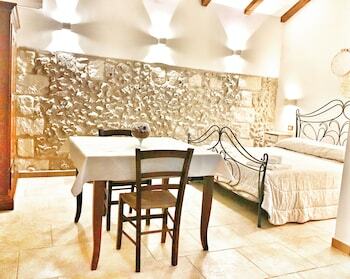 Located in Melendugno, Agriturismo Masseria Costarella is in a rural location, within a 10-minute drive of Torre Sant'Andrea and Torre dell'Orso Beach. The front desk is staffed during limited hours. A roundtrip airport shuttle is provided for a surcharge (available on request), and free self parking is available onsite. When you stay at Casa Ovile in Certaldo, you'll be within a 10-minute drive of Museum of Sacred Art and Casa del Boccaccio. Free self parking is available onsite. With a stay at Residence Spiaggia in Riva del Garda, you'll be within a 10-minute drive of Tower of Apponale and Arco Castle. Free self parking is available onsite. With a stay at B&B Cristo Rè in Campodolcino, you'll be just steps from Valchiavenna and Skiarea Valchiavenna.